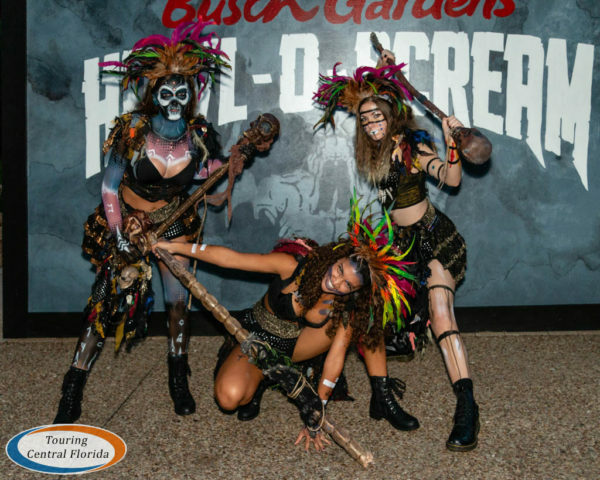 Haunt season is in full swing, and Howl-O-Scream 2018 at Busch Gardens Tampa Bay kicked off this past Friday, September 21. 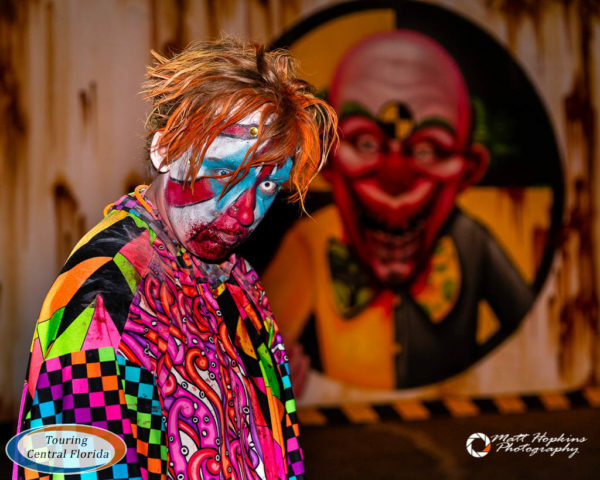 The separate admission event runs on select nights through October 28, and features six haunted houses, six scare zones, one show, and much more. 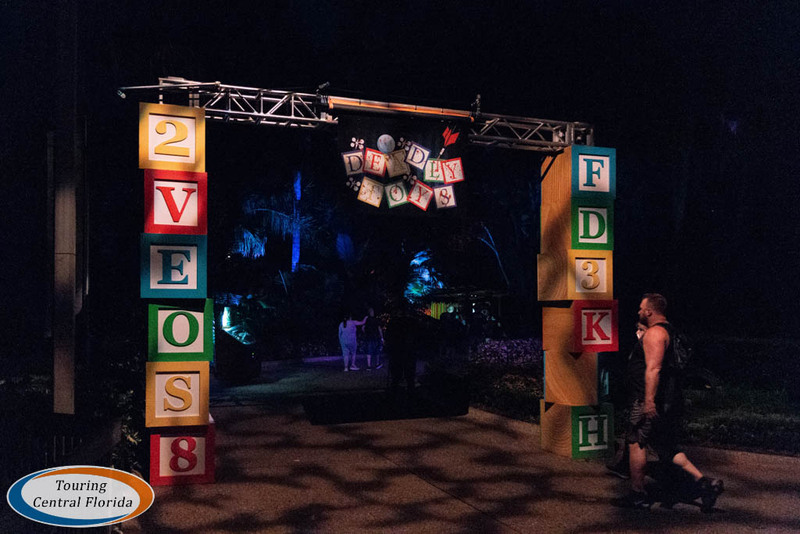 We were invited to the opening night Media/VIP event, and received complimentary admission to the event from the park, but as always all opinions are our own. 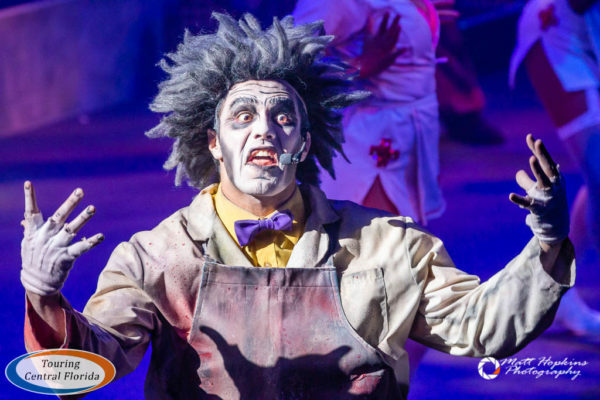 It’s also worth noting since it was opening night, there may be some changes before the second weekend based on operations and guest feedback, and that our opinion is based only on our individual experiences. Simply put – your mileage may vary. The article below does contain some spoilers, so proceed with that in mind. However, there are no images from inside any of the houses, and there are still plenty of surprises in store for you that we don’t reveal here. 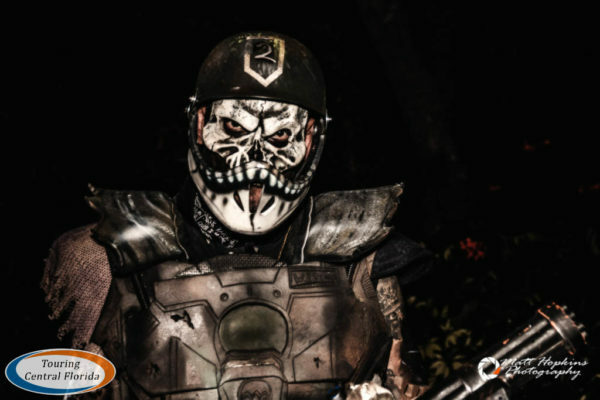 For even more details on this year’s event, be sure to check out our huge Howl-O-Scream 2018 Preview, plus dive into the Howl-O-Scream Shop of Horrors. 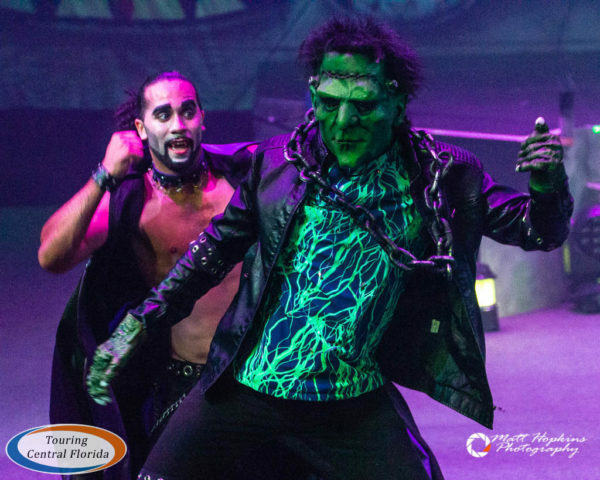 There are six haunted houses at Howl-O-Scream 2018, with two new houses joining four returning ones. Insomnia replaces Zombie Containment Unit 15, and Simon’s Slaughterhouse replaced Undead: Arena Live. 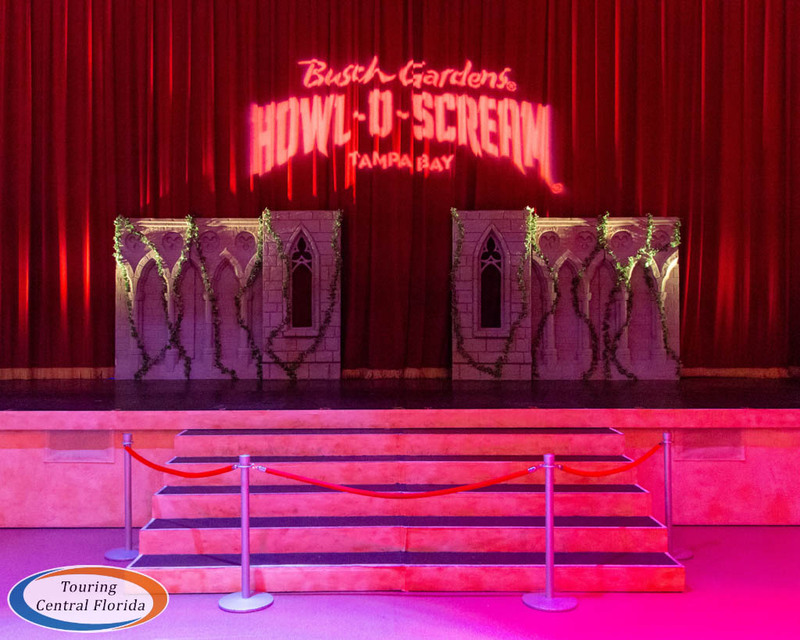 Also getting cut from last year is Demented Dimensions, which got shipped up to Busch Gardens Williamsburg for their Howl-O-Scream event. That means for the first time in quite awhile, both new houses from last season did not return. Below we rank the houses based on our experience on opening night. 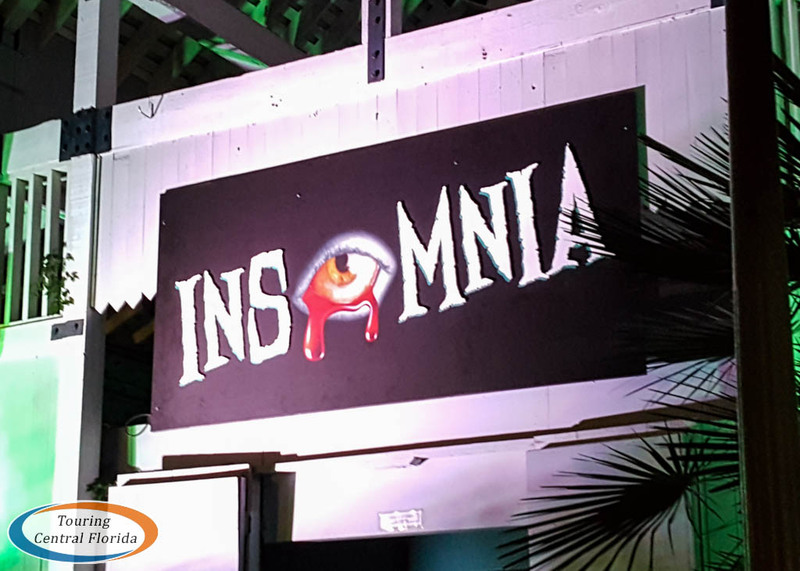 The best house of the night in our opinion was Insomnia, located in the former Akbar’s Adventure Tours building near Cheetah Hunt. We went through the house twice and still wanted to go again – the level of theming and details in the rooms make it worth multiple visits. The scare actors were great, hitting their marks and using a variety of tactics to keep it from feeling redundant at any point. There are also a number of special effects throughout the house to keep an eye out for, including a room with moving walls that can actually be a bit disorienting. Two returning houses also get high marks from us based on our visit on opening night. 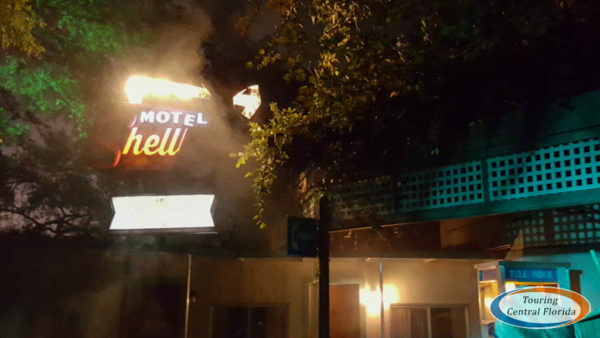 Motel Hell, now in its third season, and Death Water Bayou, the oldest returning house in its sixth season, both delivered great scares and feature a high level of detailed theming throughout. 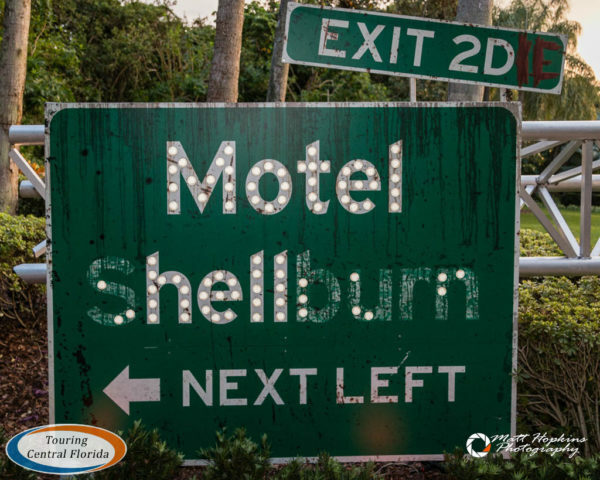 We went through Motel Hell twice, and were impressed both times by the quality and quantity of the scares. 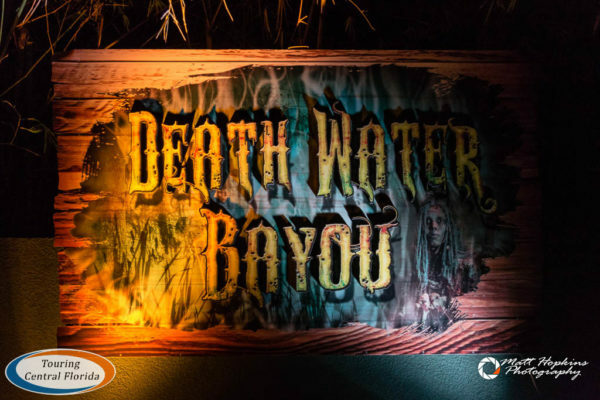 Death Water Bayou remains incredibly detailed, and provides a few really good scares, but being a familiar house after six seasons means its not as surprising as a newer house. 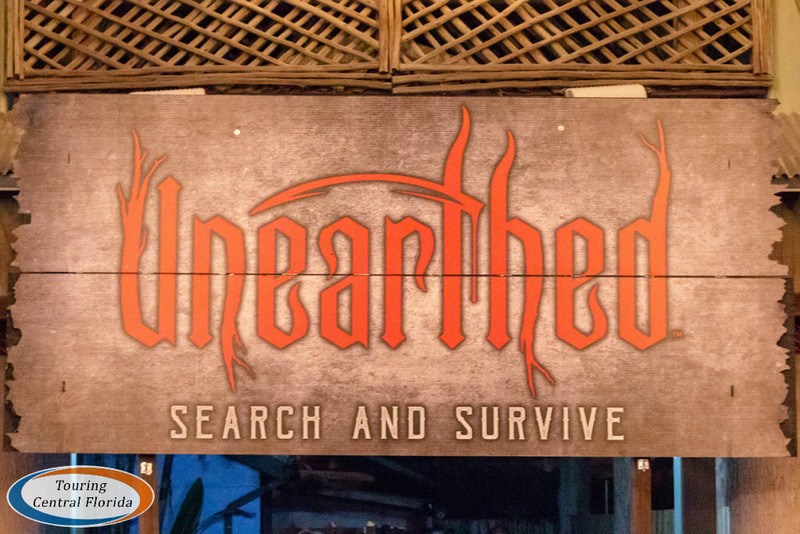 Unearthed was a strong house this season, with good scares and other effects throughout. The queue didn’t go through the former Gwazi station, but instead remained on the ground the entire time before entering the house. Also this year, each group of guests was handed a flashlight on the way in to use in the house, which added an interesting element. A flashlight isn’t needed to experience the house, but it was fun to use to point at some of the pictures and writing on the wall looking for extra details. 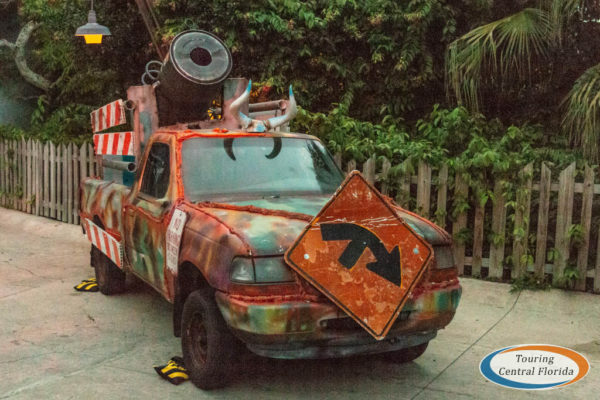 This season is almost definitely Unearthed’s last, since Busch Gardens has already teased Gwazi would be getting a revamp for 2020, and the queue area most likely won’t be available next fall. Read more about Gwazi’s history and the rumors leading up to the park’s recent teasing of its future in our recent article. 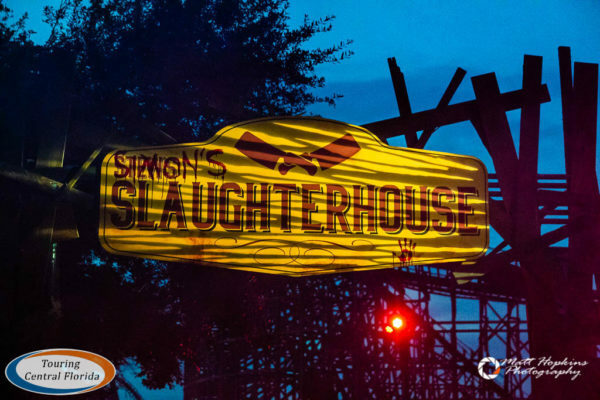 Part of the advertised 17+ suggested age area of Howl-O-Scream 2018, Simon’s Slaughterhouse is arguably the goriest of the houses at this year’s event. There is certainly more gore here than the other five houses overall, but most of the other houses have a scene or two with some graphic carnage as well. And we didn’t feel that the gore here was any more intense than in past houses with the same theme, like The Basement several seasons ago. 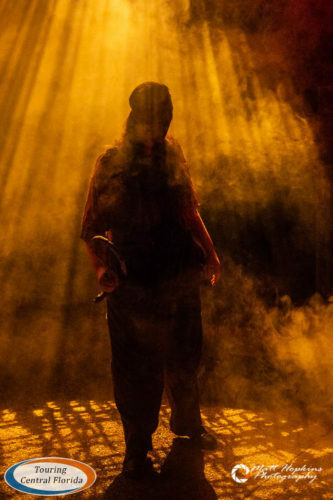 The house begins with a sorting in the stockyard outside, before you head inside and dive deeper and deeper into the gory experience that Simon says you must have. 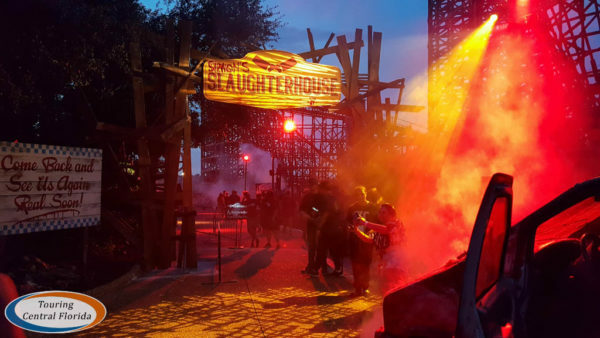 Smells combine with audio effects and the live scare actors, though we didn’t find the same level of creativity in the scares as we did in other houses. 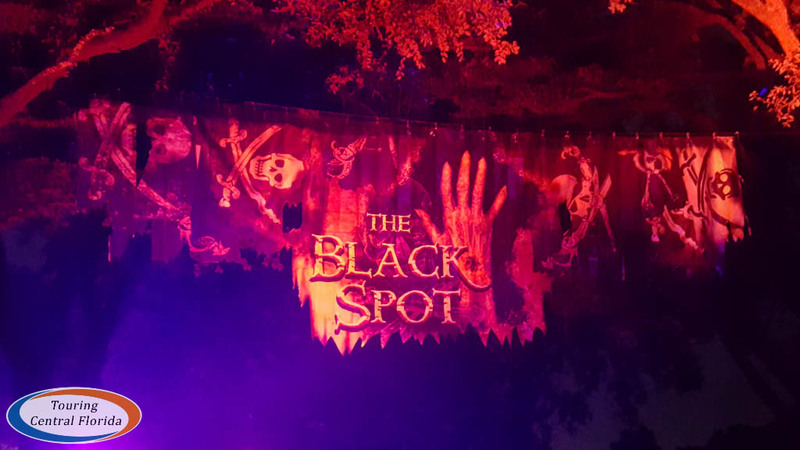 Rounding out our rankings from the first night is Black Spot, returning behind the Stanleyville Theater (and right next to the Tigris construction site). 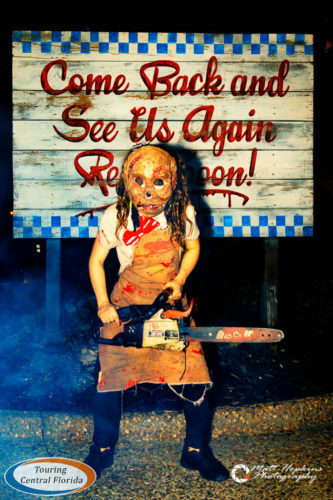 While the theming is pretty good throughout the house and the concept is fun, it doesn’t have the same level of scares as other houses and doesn’t seem to have that one incredibly memorable scene that most of the other houses possess. Black Spot also suffers from its location next to the theater where Fiends shows. After each show, a number of guests pour directly into the queues, meaning increased wait times even for those holding front of the line passes. We strongly recommend visiting this house before the first Fiends performance of the evening lets out. In addition to the Fiends crowds creating long lines, the construction walls for Tigris being bumped out onto the pathway means you can only enter the queue for Black Spot on the side near the log flume, and can only exit the house through the Zambia Smokehouse area. Assuming this isn’t changed, it makes for some traffic congestion as most guests aren’t aware of the one way set up. The reality is there are no bad houses this year – even though Black Spot came in “last” in our list, it’s a still a well-themed house that provides a handful of good scares. 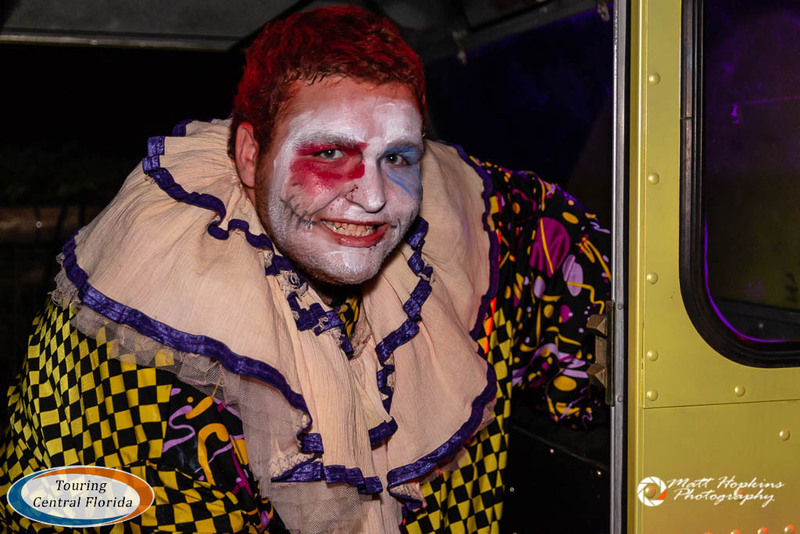 As the scare actors in each house get into their rhythm and find what works best over the first few nights, they will only get better as the season goes on. 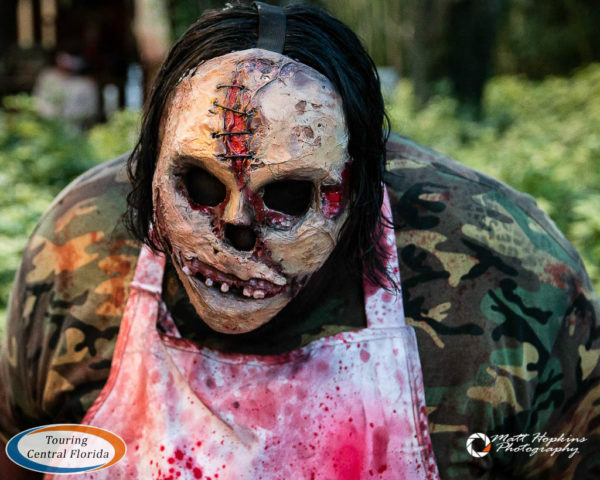 Howl-O-Scream 2018 has a total of six scare zones, with Meat Market being the only returning one from last season. Below is our ranking of the zones based on our experience on opening night. 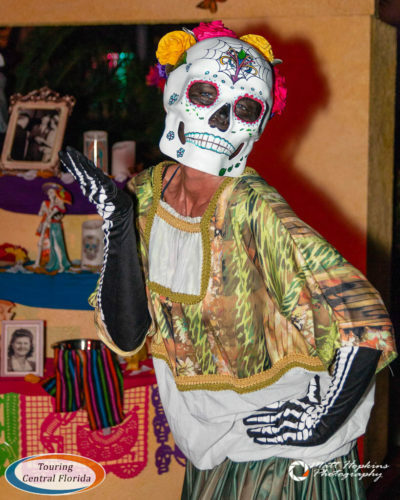 Dia de los Muertos is located around Moroccan Palace Theater and stretches up the pathway heading toward Nairobi. This is one of the three scare zones that are most themed, with a variety of props and decor. The costumes the scare actors wear here are fairly elaborate, and throughout the night there were a number of them wandering through the zone. 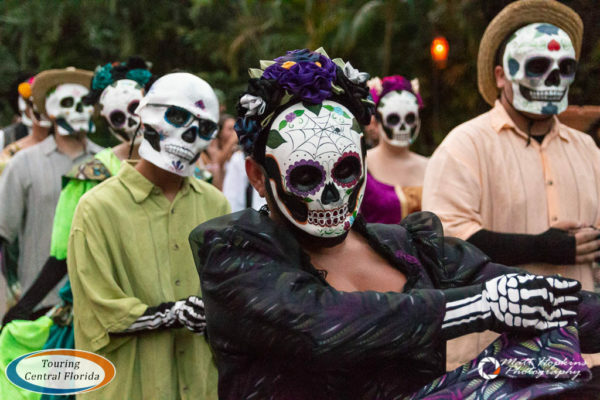 Unlike pretty much all of the other scare zones, this one doesn’t really provide much in the way of scares – it’s more about the culture and theme of the Day of the Dead. 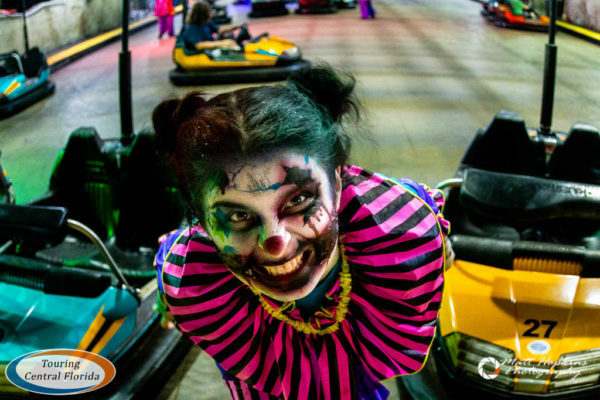 Hell on Wheels is the first scare zone you’ll encounter if you head towards Gwazi – and we found it filled with fog, large props, and scare actors. It does a great job of setting the mood for your visit, and we felt it contained some of the most aggressive scare actors in the park (and we see that as a positive). Part of the 17 + suggested age zone, Meat Market returns this season along the Gwazi Park pathway. 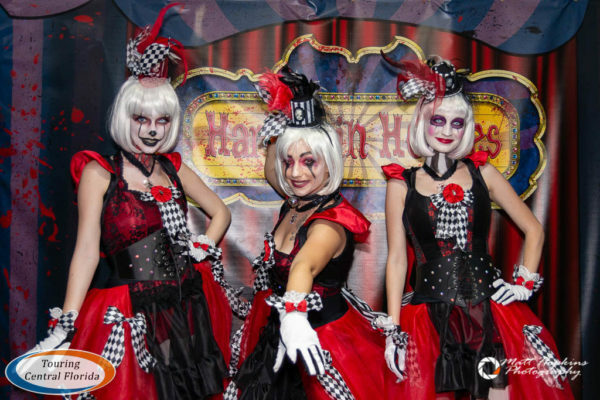 Just as last season, it’s a mix of scare zone with a number of themed props, games, and culinary stands. And just like last season, it ends up feeling a bit cramped and disjointed – it’s odd to pick up a drink and snack and then have to dodge scare actors to try and find an out of the way spot to enjoy your purchase. 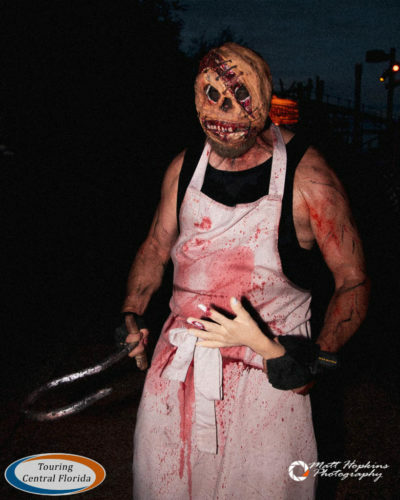 Like Simon’s Slaughterhouse nearby, Meat Market is certainly the goriest of the scare zones, but in our opinion doesn’t quite live up to the hype of being a designated 17+ zone. 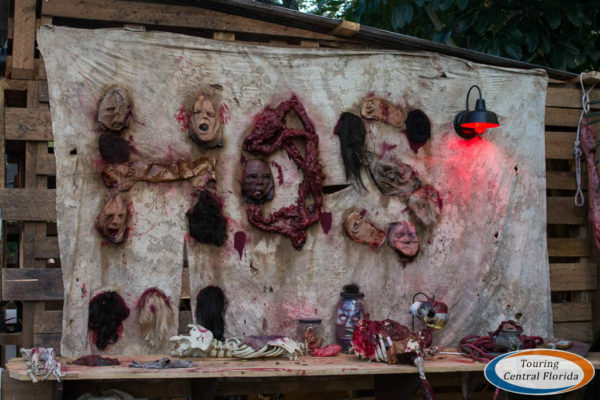 On the narrow path between Stanleyville and the entrance to Congo, Camp DOA makes great use of the tight space to fully immerse guests in the scare zone. The theming here is great, but on our two times through the zone on opening night, it seemed to be lacking scare actors, with only a small handful in the area. 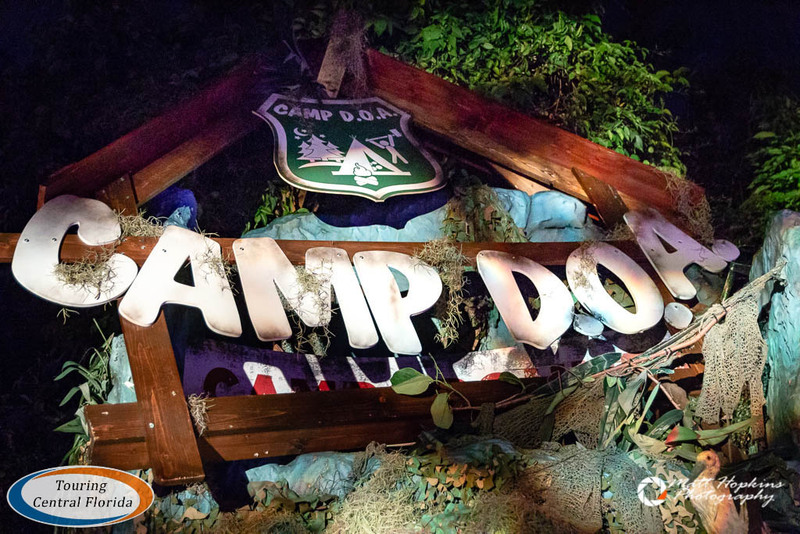 If a few more are added, Camp DOA could easily become the best in the park. 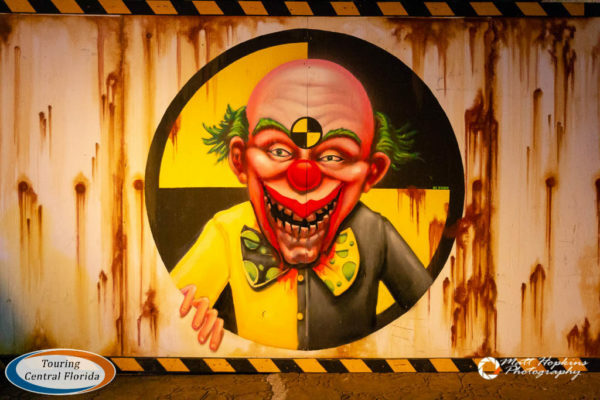 All through Pantopia, and even stretching down towards Nairobi, Maniac Midway is the largest of the scare zones, with clowns and other creepy carnival characters. There are a handful of props scattered around, but it’s really the scare actors that make it work here. We encountered a couple of very talented actors, who were really committed to their characters. Being such a large zone, however, makes them feel very spread out, so it loses the “overrun” feeling you get in smaller zones. Deadly Toys falls at the bottom of our list based on the first night, mostly because each time we passed through, there were few scare actors to be found. It may have just been bad timing on our part, but it just felt very sparse. The theming and background track here are pretty creepy, and with more actors it surely is a better scare zone than what we experienced. 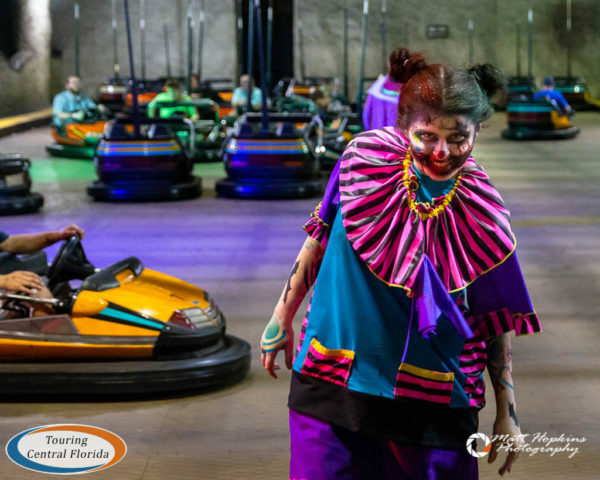 Outside of the six designated scare zones, there also other “mini” zones that aren’t on the map, like the grave diggers around the Nairobi train station and the zombie clowns around the bumper cars, which is renamed Crash Test Clowns for Howl-O-Scream. You can take a spin on those while dodging some of the crazy clowns. Also keep an eye out for roaming hordes, like the Sliders and Misfits, which can show up pretty much anywhere in the park. We also found a number of scare actors hiding in the brush along the pathways in ghillie suits, so that bush you see may not actually be a bush. 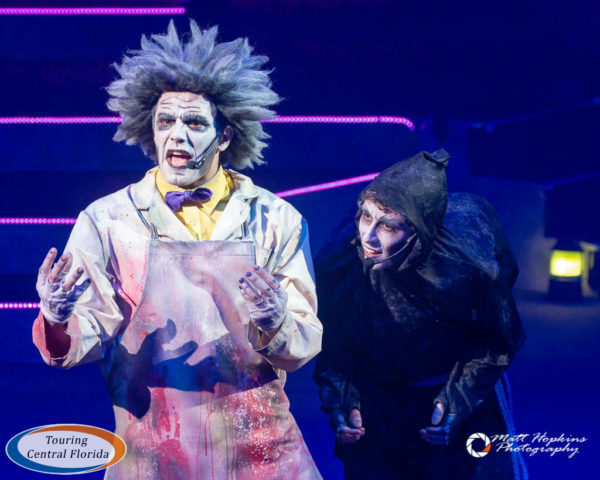 The perennial favorite show at Howl-O-Scream returns, with Fiends once again being performed in Stanleyville Theater. 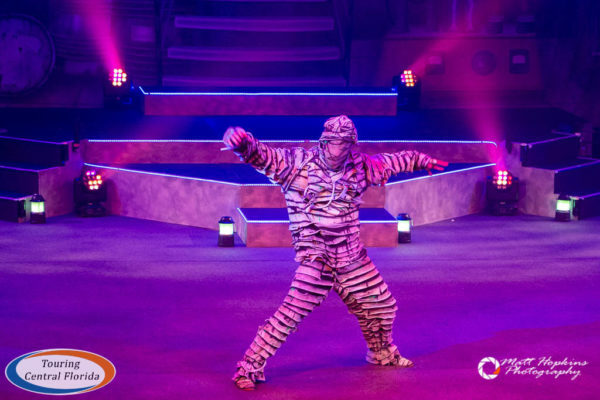 Guests join the celebration of Dr. Freakenstein’s 666th Birthday, with all of the crazy antics and dance numbers you would expect. We caught the first show of the season, and were impressed with the updated dance numbers and flow of the show. 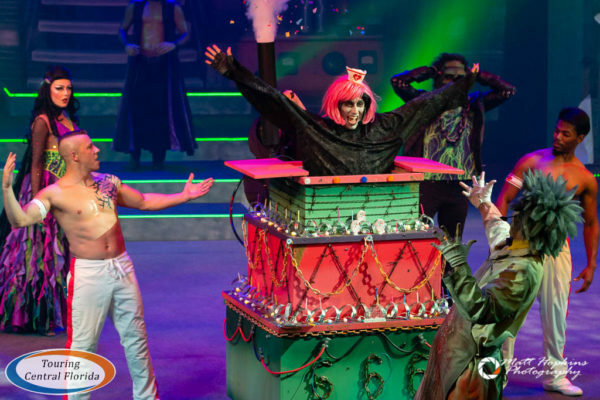 The entire cast gives an energetic performance, and there are plenty of funny moments mixed in. 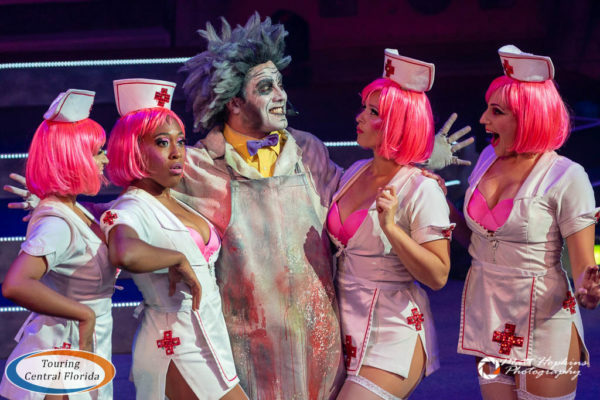 And of course naughty nurses – which are still the biggest draw for a number of guests in the audience! 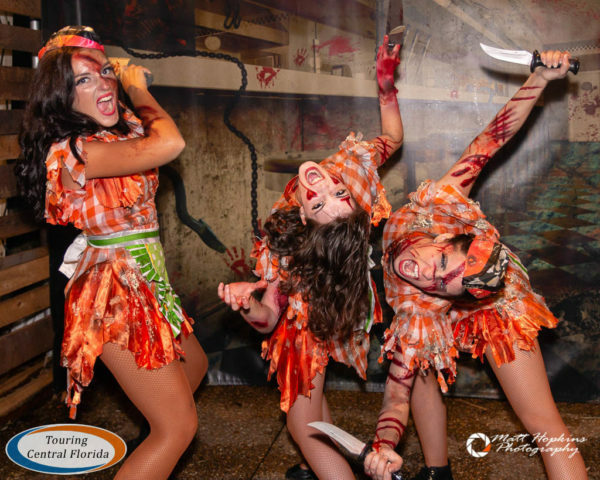 There are four official photo ops this season – Voodoo Girls just outside Zagora Cafe, Butcherettes in Meat Market, Harlequin Hotties in Pantopia, and the Naughty Nurses just outside of Stanleyville Theater. You can take your own pictures, or have a Busch Gardens ambassador take one using PhotoKey, which can then be viewed and purchased at the end of your evening at Adventure Photo in Morocco. While we didn’t participate in Fright Feast on opening night, we did here from others who went that the food and show part of the package didn’t live up to their expectations as it had in years past. 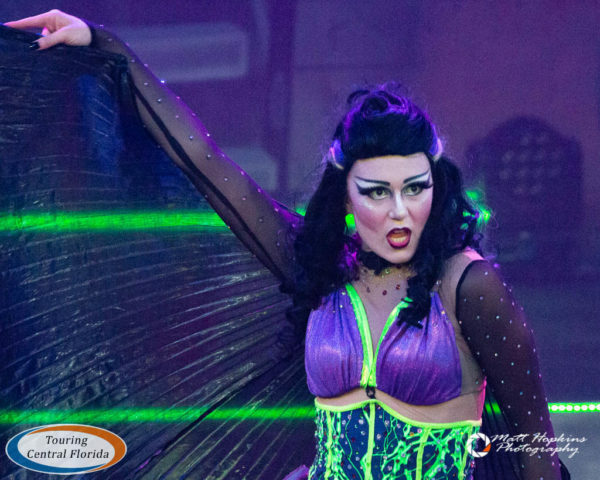 The Fiends preview performance was reportedly rather short at around ten minutes. 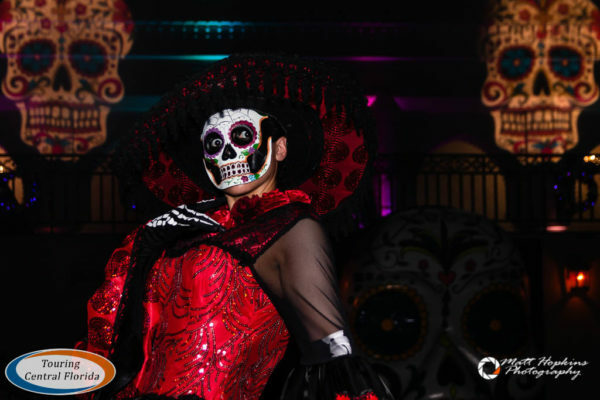 But Fright Feast still includes front of the line access to the houses until 8:30 p.m., so it may still be worth it from that angle. 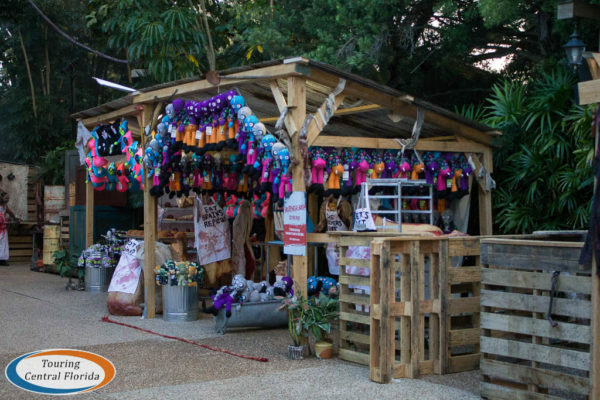 Elsewhere in the park, look for a number of booths with special food & beverage options. The two signature cocktails this season are Once Bitten and Dark Spirits. Once Bitten is blood orange blend, sour mix, and tequila. Dark Spirits is wild grape, cranberry, lemonade, and vodka. Either drink is available for $10.99, or in a souvenir light-up pilsner for $13.99 (with $8.99 refills). No grasshopper tacos in Meat Market this year, but we did see menus around the park featuring items like hot melts, specially seasoned fries, and more (ranging from $6.99 to $10.99). With ticket prices starting at $39.99 online ($34.99 for pass members), Howl-O-Scream is definitely worth the admission price. 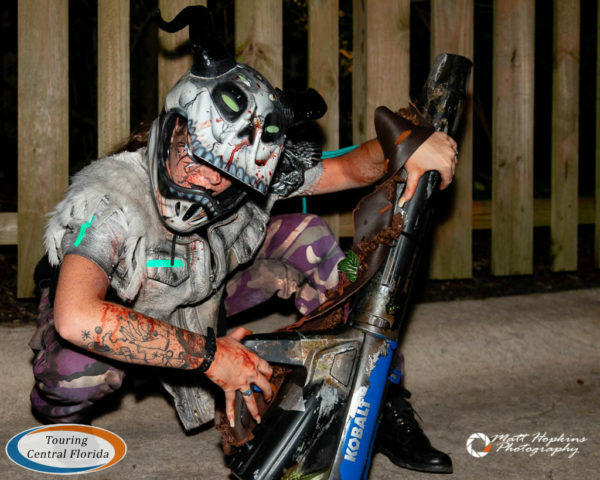 Along with the six houses, six scare zones, Fiends show and other haunted activities, most of the major roller coasters are open to enjoy, including a few where scare actors actually ride along. 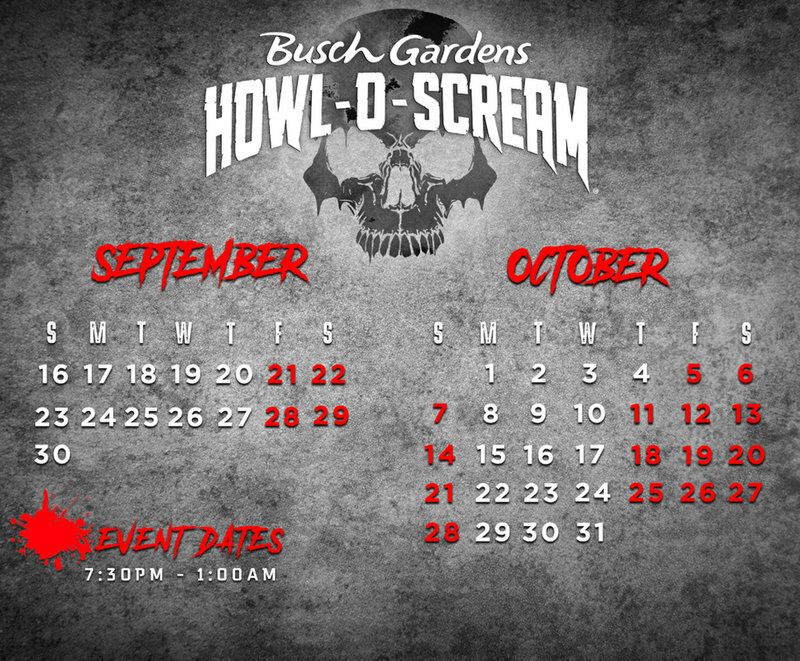 Howl-O-Scream 2018 at Busch Gardens Tampa runs on select nights through October 28. For more details on this year’s event, check out our in-depth preview! Thanks to photographer Matt Hopkins for a number of the images in this article. Join in the conversation on social media by using #HowlOScream, #NowhereToHide, and #HOS18. 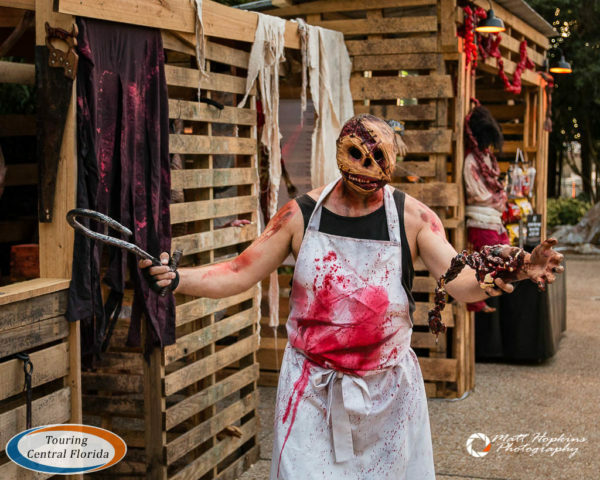 For the latest on Howl-O-Scream 2018 at Busch Gardens Tampa and other theme parks, attractions, dining venues and more across the region, be sure to follow Touring Central Florida on twitter @TourCentralFL, @androckb, @Emmet_TCF, @JacobTouringCe1, and give our facebook page a like.